Opinion Hong Kong’s leader wants to be accountable. Why would Beijing stand in the way? Hong Kong’s leader wants to be accountable. Why would Beijing stand in the way? Chinese President Xi Jinping, right, meets with Chief Executive of Hong Kong Special Administrative Region Carrie Lam, who is on a duty visit in Beijing, China, on Dec. 17, 2018. Frank Ching is a Hong Kong-based journalist. 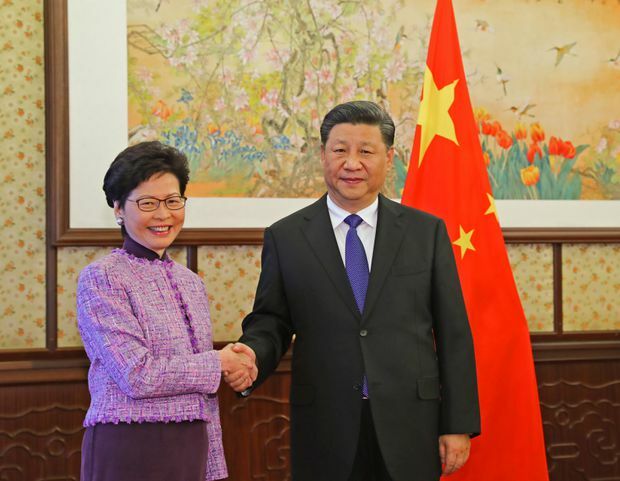 Ever since Carrie Lam became chief executive of Hong Kong on July 1, 2017, she has enjoyed virtually absolute support from the Chinese government, including President Xi Jinping himself. This isn’t surprising; she was, after all, Beijing’s hand-picked candidate to govern the former British colony, now known as the Hong Kong Special Administrative Region. But ironically, Beijing is now proving a problem for the chief executive in her attempt to keep a major campaign promise: to resolve, as soon as possible, "those constitutional and legal issues aiming at amending the Prevention of Bribery Ordinance to extend the scope of sections 3 and 8 to cover the chief executive.” That’s because her office – the top job in Hong Kong’s hierarchy – is not currently covered by key sections of Hong Kong’s anti-corruption legislation. While “soliciting or accepting an advantage” is a criminal offence for the 160,000 civil servants in Hong Kong, the provision doesn’t extend to the chief executive. Similarly, anyone who offers an advantage to a public servant while dealing with the government department shall be guilty of an offence – unless, of course, that public servant happens to be the chief executive. Momentum to reform the anti-corruption legislation has been building since 2012, when an independent review committee headed by former chief justice Andrew Li concluded that a “fundamental defect” in the existing legislation is that certain sections of the bribery ordinance don’t apply to the chief executive. The review recommended the creation of a statutory independent committee, consisting of three members appointed jointly by the chief justice and the president of the legislature, which would grant permission for the chief executive to solicit or accept any advantage. That momentum only accelerated with the imprisonment of former chief executive Donald Tsang, who was sentenced to 12 months in prison for failing to disclose a property deal. He was released in mid-January. Ms. Lam’s immediate predecessor, too, did not face trial after Hong Kong’s Department of Justice controversially declined to prosecute Leung Chun-ying over an undeclared 50-million Hong Kong-dollar payment (approximately $8.5-million) from the Australian engineering firm UGL. Secretary of Justice Teresa Cheng was sharply criticized by legislators and the Hong Kong Bar Association for not seeking outside legal advice before making the decision, which critics said was contrary to departmental practice in cases involving high officials or prominent individuals to avoid the appearance of bias. Beijing holds that the chief executive is not only the head of the government, but head of the region. It may well find objectionable a proposal to subject the chief executive to a committee appointed by the heads of the legislature and the judiciary. Is Hong Kong losing its autonomy?